Did you know we’ve been in our new shop for 1 year already?! Come celebrate with us this Friday Jan 26th 4:30-7:30 at the shop! We will be partnering with Eluvium Brewing for tastings of their beer brewed with honey, and Shanti Elixirs will be slinging up her amazing jun! 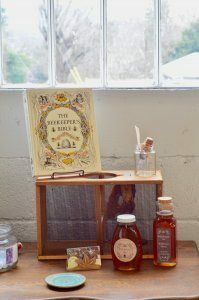 Also, there’s still time to enter the raffle to WIN 1 PACKAGE OF BEES — $5 to enter + drawing is at 7 pm this Friday during our event (don’t worry, if you can’t make it, we’ll call ya if you win)!